My Adaptation of "The Sorrow of Akivasha" and an original piece, "Home for the Hunt", were collected in The Colossal Conan the Cimmerian. Conan returns to his homeland to explore his roots and find renewed purpose as a young mercenary. 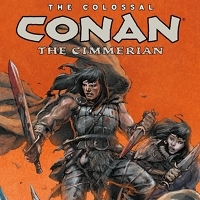 This complete collection of Dark Horse's Conan the Cimmerian run gathers issues #0 to #25 of that celebrated series together, including all variant cover work! The award-winning creative team of Truman, Giorello, and Villarrubia adapt several of Robert E. Howard's original Conan stories and tell new tales that tie everything together chronologically. * Presenting all Dark Horse's Conan the Cimmerian comics in a deluxe, oversized hardcover!